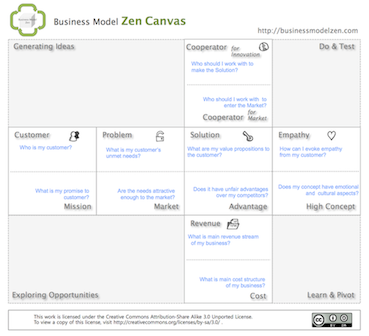 The Business Model Zen Canvas was proposed by Cho, Yongho based on his book published on June 2013 in Korea: Business Model Zen. Business Model Zen is business modeling methodology that builds upon the disciplines of customer orientation, strategic thinking and loop learning by execution. It is consolidation of the various researches on business models, since 2009, into the form of essential methodologies and toolkits. Business Model Zen provides a single logical frame where a business is systematically modeled and proactively managed, from idea to design and execution. If you want to try it out without entering your email address, please use our public Business Model Zen Canvas Demo for a first impression.